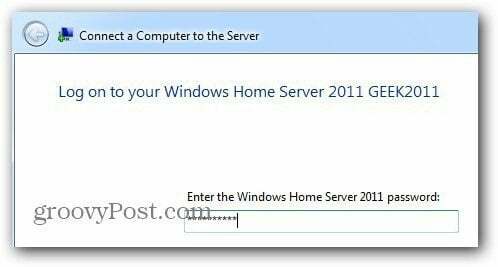 I’m currently running Windows Home Server – version one which runs on Microsoft Server 2003 technology. WHS 2011 has been out for several months now, and I’ve decided to upgrade. 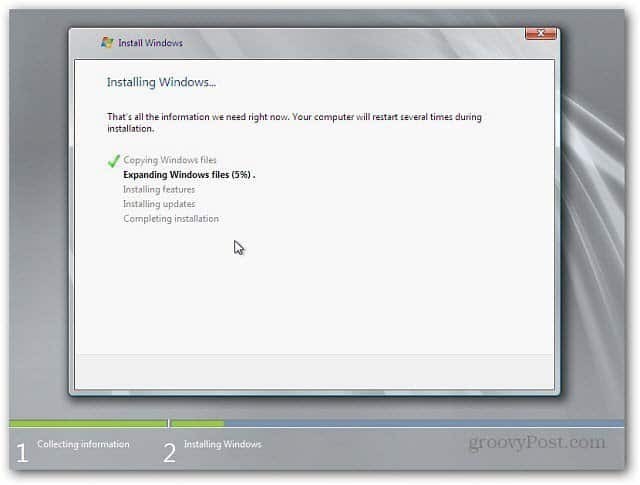 Here’s how to do a clean install of WHS 2011. Before you begin, there are a few things you need to know. Unlike its 32-bit predecessor, WHS 2011 is 64-bit only and requires a minimum of a 160 GB hard drive and 1 GB of RAM. Of course these are the minimum specs – so at least double everything. Plus, since you’re going to backup your PCs, store multimedia, photos and all of your documents on it, you’ll want a good amount of storage. Unless you have an MSDN or TechNet subscription, you’ll need to buy a physical copy of WHS 2011. It varies in price but is well under $100 which is a great thing! If you do download the ISO from Microsoft, use Windows 7 Disc Image Burner to create the bootable install DVD. First, make sure the system is set to boot from the DVD drive first. You can do this in the BIOS or hit the appropriate key during startup that lets you select a temporary boot device. Pop the install DVD you bought into your system’s drive. The first screen you’ll need to interact with is selecting a New Install or Repair. Since this is a brand new system, I’m selecting New Installation. Next select the drive you’re installing WHS 2011 to. Check the box that you know the data on the drive will be wiped. Click Install. Note: If you don’t see the local drive listed, you’ll need to load the drivers for the controller. Find the drivers and burn them to disc or put them on a USB drive. 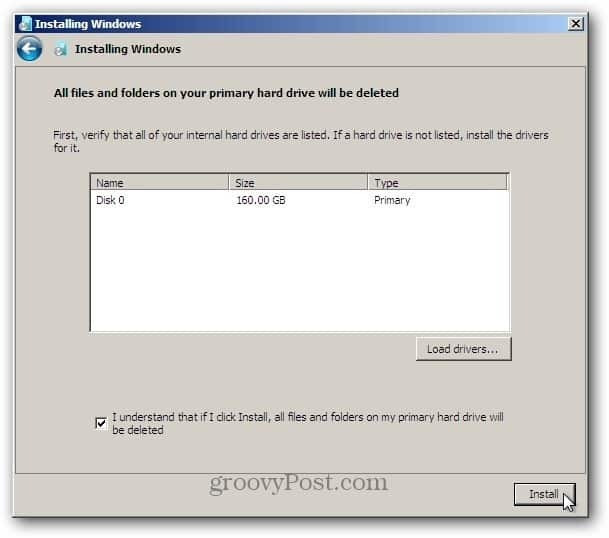 If you have to do this, remove the WHS 2011 install DVD and swap it with the driver disk. Then click the Load Drivers button and browse to the location of the drivers and install. Once the local disk is recognized, start the installation. Again, the process looks like installing Windows 7. The server will reboot a couple of times during the first stage of the install. You’ll see a series of different screens while the server is installed. There is no user interaction required during this stage. When it gets to the following screen, you’ll need to enter some information. Verify your Country, Time and Keyboard Layout. Click Next. 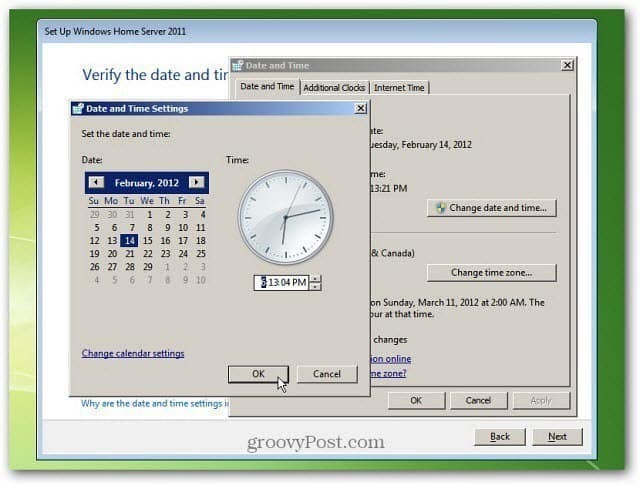 Set the Time and Date for the server. 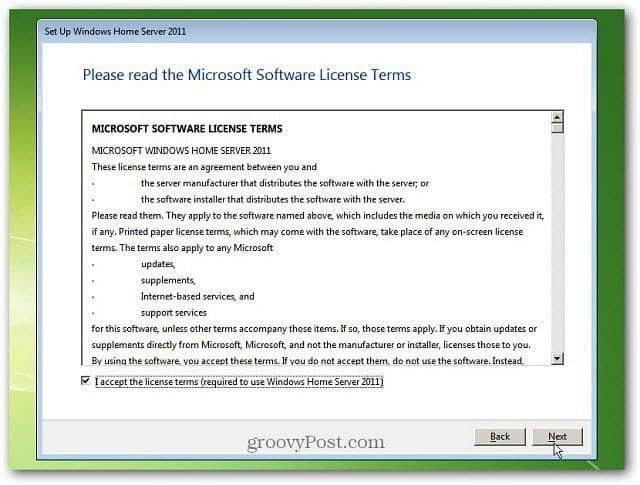 Agree to the Microsoft Software License Terms. Click the I Accept box at the bottom. Click Next. 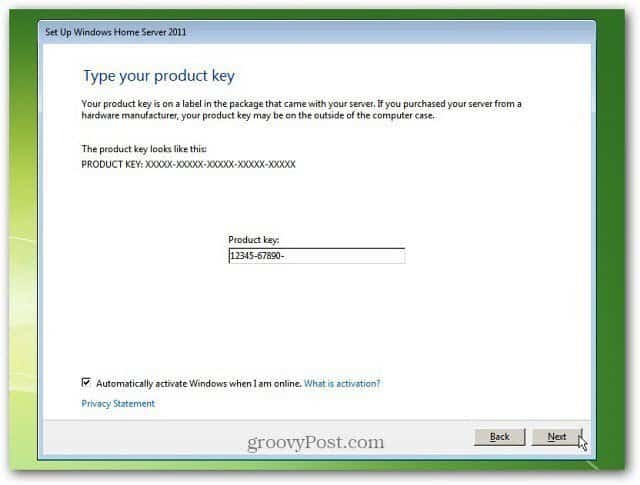 Now type in the product key that came with WHS 20111. Then check Automatically activate when I’m Online. This gets the activation over with so you don’t have to deal with it later and get nag screens. Click Next. 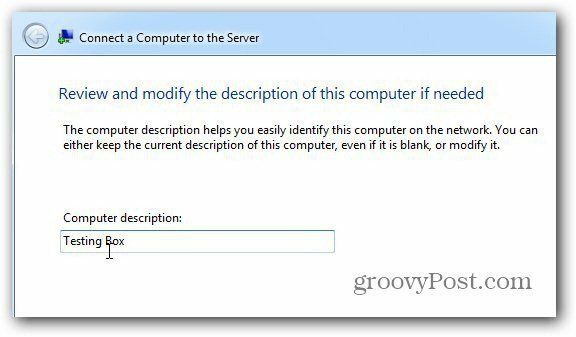 Now you need to give your server a name…be clever, it’s your new server! The name needs to be under 15 characters though. Enter in a strong password twice, then type in a password hint. Keep in mind that everyone can see your password hint, so don’t make it too obvious. Click Next. That is all the information WHS 2011 needs from you. This next stage of the install takes the longest amount of time. 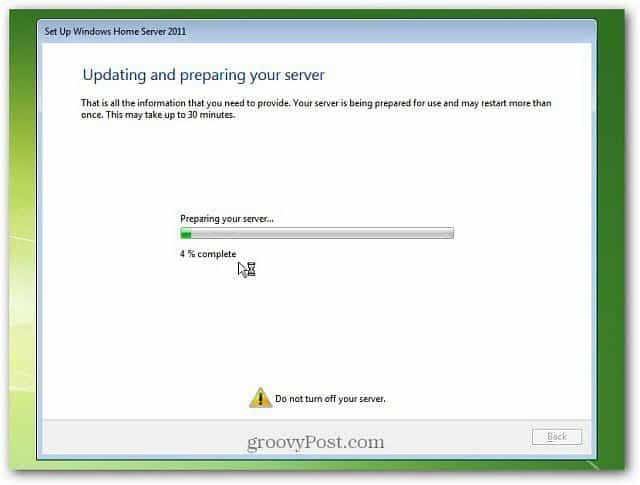 Your server will be updated and configured to use. It will take a half hour or more – depending on your system specs. You can leave it alone and check on it periodically to make sure everything is working correctly. After a half hour we have success! 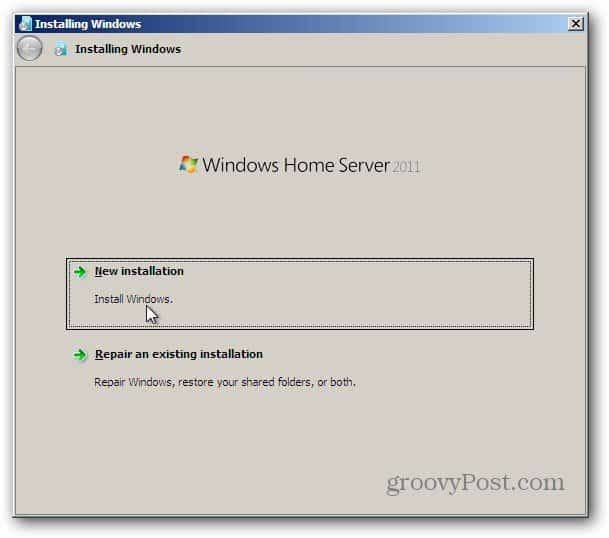 Windows Home Server 2011 has been installed and is ready to use. Click Close. 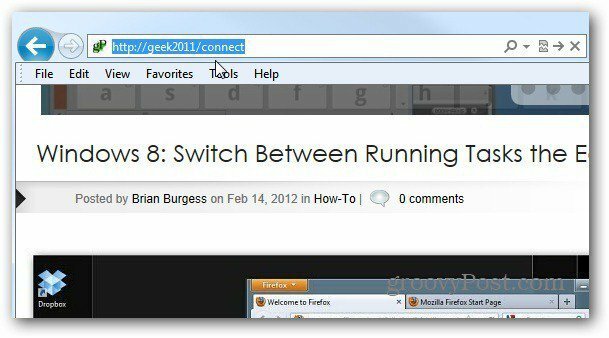 This lets you download the software that helps you connect your computer to WHS 2011. You’ll download wlsetup-web.exe – launch the file and follow the wizard. The system will verify you have the necessary components such as Microsoft .NET Framework 4.0 or later. If you don’t, the installer will download and install it for you automatically. After the necessary components have been installed, type in the password you created for WHS 2011. Then continue to work through the wizard. It’s straight forward and text based. You’re asked to enter a description of the client computer, whether or not to wake it up for backup and if you want to join the MS Improvement Program. The client connector software is installed. When it’s finished, you’ll get the following message. 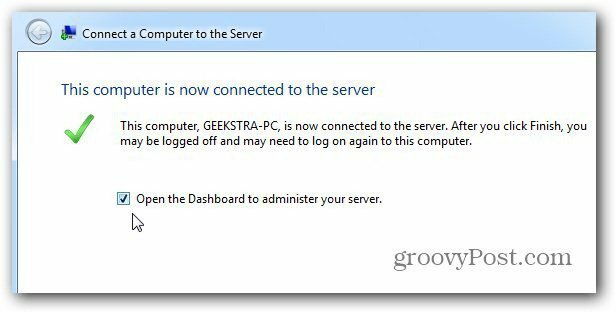 Check the box to Open the Dashboard to Administer Your Server and get started right away. Click Finish. The Dashboard (formerly called WHS Console) launches. 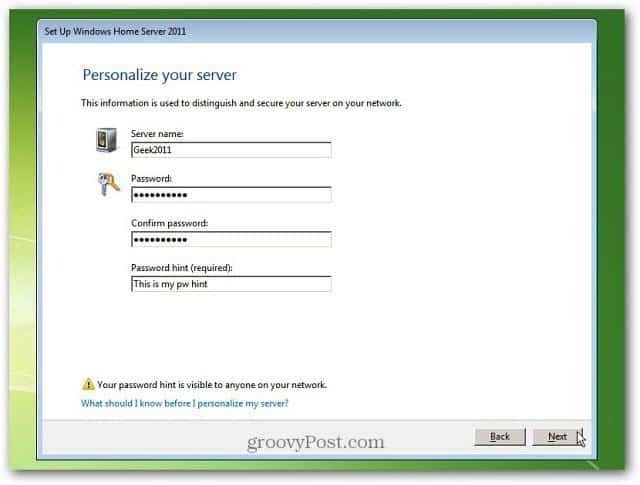 Sign in with the password you gave your server. Click Options and check to remember the password and select add-ins to load. 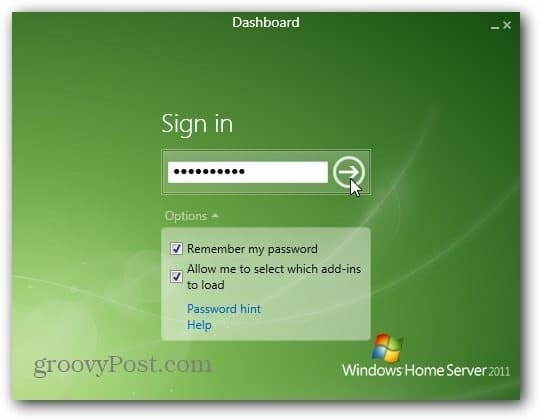 After signing in, you’re presented with the Windows Home Server 2011 Dashboard. This is where you’ll do the majority of your admin activity with the server. Start with completing the tasks listed. 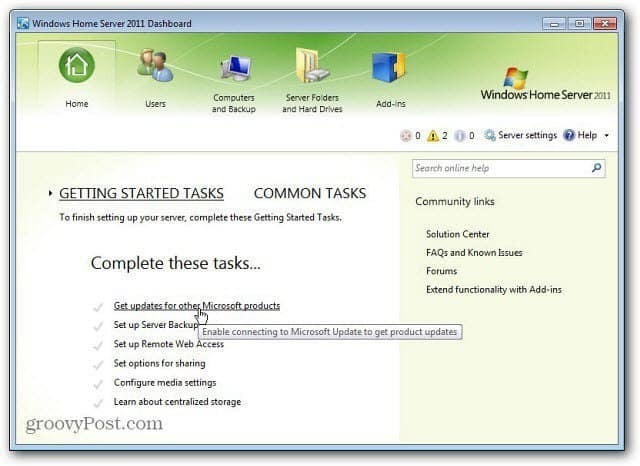 Start with Get Update for Other Microsoft Products and work your way down the list. A lot has changed since version one of WHS. In the coming weeks, I’ll be writing more articles on what to do next and cover the many groovy things you can do with WHS 2011. I have used CloudBerry previously when I ran my version 1 home server. It does a good job. One day my server crashed though… unfortunately and I didn’t reinstall CloudBerry…but I was able to get all of my data back thanks to the CloudBerry service and some other WHS backup techniques I was using at the time. Thanks so much for this walkthrough! I know what I’ll be doing soon… I too had a WHS version one that failed and it has just been sitting there unused for the better part of a year while I tried to figure out how to do a factory restore on the thing. Upgrading it to WHS2011 will be great! Quick question: did you upgrade the stock 1.8GHz AMD Sempron 3400+ processor to something bigger? If so, what? I had already updated the RAM to a 2GB stick, but just wanted to see if you upgraded the processor too. THANKS! @Brian Schmitz: Actually, I build my own via an extra desktop. So, I have an Intel Core 2 Duo CPU with 8 GB of RAM. As long as your CPU can run a 64bit CPU you should be fine. Wouldn’t hurt to upgrade the processor. You might want to install WHS 2011 and see how it runs before doing the upgrade. 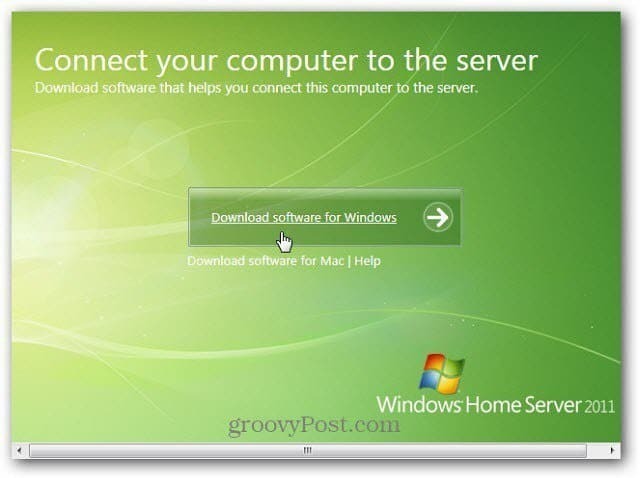 I know it is best not to use a server as a desktop but can you do it with Windows Homes Server 2011. I know that you can do it on other versions of Windows Server using Terminal Services but concerned that Microsoft may have taken something out of the Home version that cripples its capability. I am thinking of primarily of Office 2010, our camera software to download pictures and a few favourite games like Spider Solitare, Freecell, Solitare, and Scrabble. I would use it as my desktop and would set up both an Administrator and a user acccount for myself. I should also tell you that I retired about 18 months ago after a 37 year career in Information Technology and still do a little consulting. I have bought, built and managed Windows Servers and desktops since 1994. I am comfortable in doing almost anything IT, just do not have any experience with this product.